One of the reasons I like to read books on matters concerning the faith is that periodically I find an author who has so well articulated what I believe about said topic (but I haven’t articulated well) that I not only find myself overjoyed and grateful for coming across his work but keep it in my staple of books I eagerly recommend when the appropriate time arises. 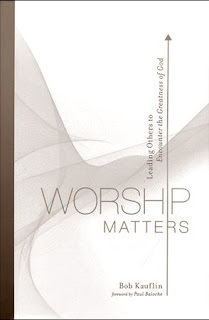 Worship Matters by Bob Kauflin is one of those books. For quite some time I’ve lamented the current day worship scene (see my posts “Flying A Little Lower” and “‘Christian’ Music”). I cringe at music leaders who have a propensity to focus on “catchiness” of congregational music at the expense of both theological accuracy and Gospel clarity. I also can’t stand when someone walks to the mic after the music is over and says to the effect, “Now that worship is over our pastor is going to come and teach.” When did worship become confined to only singing songs? Likely the music leader doesn’t realize what he is saying, but that’s half the problem. I’ve always thought, outside the teaching team, those who lead music need to be as theologically astute as anyone else who leads the church. Why? Songs teach. They always have and always will. And if you are at a church where the music minister/leader/pastor selects the songs, having someone who can discern the best music that is good both musically and lyrically is critical. Oh to have a reformation in corporate worship where both artistry and doctrine aren’t on different sides of the spectrum.Okay, I can see this is turning into more of a rant than a post…sorry for the digression…back to Kauflin’s book. I don’t know if I’ve read a book of recent that excited me with every page turned as Worship Matters did. Kauflin, the director for worship development for Sovereign Grace Ministries, breaks down his book into three sections: the leader, the task and healthy tensions – each of them chock-full of insightful, gracious and most importantly, biblical teaching about worship. From explaining why the Cross is crucial to worship to how to choose the right songs, Kauflin excels both theologically and practically (can those really be separate anyhow?) when it comes to leading corporate worship. After each section I found myself saying how grateful I was for Worship Matters. Unlike many books, I don’t believe there was one wasted chapter. No filler or fluff. One will likely get the feeling that this book has been years in the making for Kauflin and the Western, contemporary church (of which I’m a part) will be richer for it. I don’t know what excites me more, knowing there is a book which so well addresses the issues involved with corporate worship or that each of those on our music team have a copy and will be reading it as a team over the summer (some have already finished it and gratefully felt reaffirmed by it). If you’re a pastor (like me), get this book not only for your music team, get it for yourself. Believe me, it’s at the same time encouraging and convicting. You may not agree with every conclusion he comes to (e.g., use of prophetic gifts in congregational worship) but I think most of your disagreements will lie on the periphery. If you’re planting a church use it as both a touchstone and educational piece for those you might consider adding to your music staff. Years ago I was asked by Good News Publishers if I would publicly endorse a Bible translation which I and our elders had chosen to use for all adult church services. I didn’t hesitate because I think the English Standard Version is the best translation around. No question. (I’ll leave exactly why for another future post) For what it’s worth (which admittedly isn’t much), I feel the same way about Bob Kauflin’s Worship Matters. It’s simply the best book I’ve ever read which so aptly addresses the current state of church worship with biblical fidelity, theological clarity and pastoral insight. I warmly and highly endorse it! Thanks Bob for a great and needful contribution to today’s Church! May God continue to bless you and the ministry he is working through you. Need I say more? Get this book. I’m game for it anytime Tim!